This is part 3, a continuation of the post on Big Data Ecosystem for Science and Big Data Ecosystem for Science: Genomics. 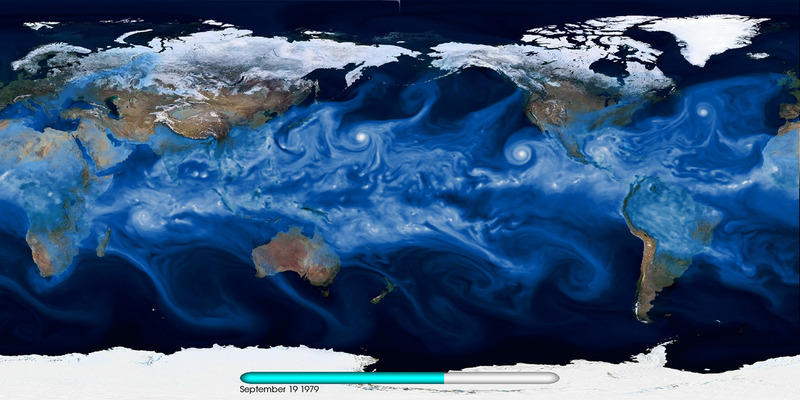 Climate scientists routinely exercise complex, large-scale climate simulation codes (CAM, WRF, CESM, MPAS, etc.) in a highly parallel fashion on O (10,000) cores on high-performance computing systems (e.g., Edison and Cori at NERSC). These simulations can be configured to explore a broad range of scenarios (e.g., how will the Earth warm under a business-as-usual scenario versus broad adoption of carbon-emission-friendly technologies). A different class of codes are also run in “re-analysis” mode, which produces interpolate satellite and weather station data to produce global maps. International products (NCEP, ECMWF, 20CR, JRA-55, etc.) from various modeling centers are readily available for the research community. Perhaps the most elaborate set of simulations are conducted under the Coupled Model Intercomparison Project(CMIP). The CMIP Phase 5 (CMIP5) data set comprises more than 5 PB of data representing more than 25 climate models from various countries.